Chem-Plate Industries, a fastener plating and heat-treating company with three facilities in Elk Grove Village, is a prime example of the form of management known as vertical integration. "Inefficiency and hold-up while you're waiting for necessary supplies and services are common problems in manufacturing," says Martin Straus, president of Chem-Plate Industries. "Because we control several different elements of the fastener supply chain, we enjoy much faster turn-around times, lower transactions costs, and advantages over the competition." Straus began his career as a day laborer at a plating company in Boston, then became an entrepreneur in his own right by opening a plating company on the south side of Chicago in 1979. He moved the company to Elk Grove Village in 1992 because its proximity to O'Hare Airport allowed him to better service his 250-member customer base in Rockford, Chicago, and northern Indiana. Today, Chem-Plate Industries owns and operates out of three facilities: an 80,000-square-foot building on 1800 Touhy Avenue, a 90,000-square-foot facility at 1990 E. Devon Avenue, and 110,000 square feet at 1250 Morse Avenue. Between them, these facilities specialize in providing corrosion-protective coats of zinc, zinc nickel and zinc phosphate plating for various kinds of fasteners used in the automotive, military, and construction industries such as nuts, bolts, screws, washers, rods, pins, clamps, and capscrews. 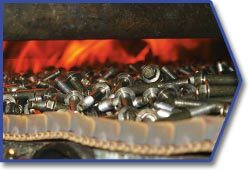 Chem-Plate Industries also provides a full range of other services for fasteners, including continuous heat-treating, induction hardening, stress-relieving plating, dip spinning, electro-coating, top coats and finishes, PACE machine sorting, hand and roll sorting, and packaging. Plating involves depositing a metal coating onto a conductive surface such as steel. It is used in industry to improve the durability, solderability, and paint adhesion of the surface, as well as to harden it and modify electrical conductivity. Several different application methods, as well as different metals and combinations of metals called alloys, can be used in the plating process. Zinc plating, which is the primary coating used by Chem-Plate Industries, is especially good at preventing rust on steel surfaces by forming a protective barrier against oxidizing elements in the atmosphere. Even if zinc plating forms cracks, it still cathodically protects the exposed steel against rust by forming a layer of insoluble zinc salts. Galvanized steel parts, which utilize zinc plating, can usually last up to 30 years. Heat-treating, the other major service provided by Chem-Plate Industries, alters the physical and/or chemical properties of a material. Induction heating is a common form of heat treatment at Chem-Plate Industries in which fasteners are heated by electromagnetic induction, then immediately quenched. 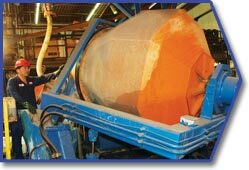 This process increases surface hardness and strength without affecting the core of the product. 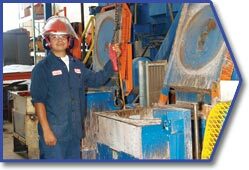 Chem-Plate Industries' labor force of approximately 300 employees includes degreed metallurgists and chemists, as well as technicians specially trained for specific processes. Martin Straus' son Aaron maintains the family leadership of Chem-Plate Industries by currently acting as the company's general manager, and will eventually take over as president. 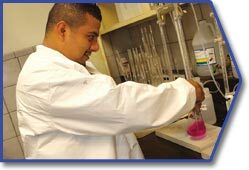 Aaron, who earned a Bachelor of Fine Arts from the School of the Art Institute in Chicago (with a final semester at Yale University), prepared himself for the top position by starting out in Chem-Plate's quality control lab, then building and running the mechanical plating department before becoming general manager. "We have a very diverse workforce here at Chem-Plate Industries," says Aaron Straus, "including many women employees and female managers. Generally, we don't hire managers from the outside. We believe in promoting from within, so that our employees can meet their potential and departments can be led by those who are most familiar with the processes involved. We also believe in hiring returning war veterans. The company will be adding about 30 new employees this year, and we hope to hire as many veterans as we can." Besides its vertical managing methods and varied staff, Chem-Plate Industries also prides itself on its maintenance of high quality levels and its outlay on state-of-the-art technology. "Our high quality is something we always get complimented on, and it's also what helps keep our customers from turning to foreign outsourcing for the most part," says Martin Straus. "We are also constantly up-grading and improving the processes we offer by installing new technology. 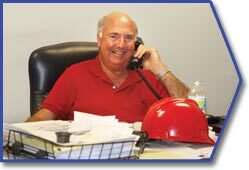 We try to set precedents in the fastener industry." An example of the innovative equipment Chem-Plate Industries is willing to invest in is a planetary motion coating machine, the first one of its kind in the United States. The machine works by rotating baskets of parts around each other while they are dipped in paint. This planets-around-the-sun motion ensures even and complete coating of complex parts. Chem-Plate Industries also recently perfected a durable black finish for automotive fasteners called Tuff-Black™ 2500. As a supplier of black finished fasteners to both Ford and General Motors, Chem-Plate Industries was familiar with the way that black finishes tend to eventually corrode and lose color after the fasteners undergo the automatic sorting procedures that are performed before they are installed. After much experimentation, Chem-Plate's chemical experts and sorting department succeeded in working out the optimal combination of black finishing technology and appropriate sorting procedures which would preserve the corrosion protection and the color of its black finished fasteners. Chem-Plates Industries has also introduced ArmorGalv®, an award-winning "green" technology which involves a process called thermal diffusion coating. The ArmorGalv process was awarded the MVP2 (Most Valuable Pollution Protection) Award by the United States Environmental Protection Agency in 2006. With ArmorGalv, which Chem-Plate Industries will be providing for the United States Navy, steel fasteners are heated in a closed cylinder to at least 650°F along with a special blend of dry zinc powder. The heat transforms the zinc powder from a solid to a gas, which then diffuses into the surface of the fasteners. This results in a consistent, corrosion-resistant zinc/iron alloy coating which has none of the toxic qualities found in the cadmium that was previously used for plating. ArmorGalv, which uses minimal water and generates hardly any landfill material, is also a much more environmentally-friendly procedure than other methods of barrier protective coating such as paint, electro-plating, and hot dip, says Aaron Straus. "We are pushing to replace these other methods of coating with thermal diffusion processes such as AmorGalv," he says. 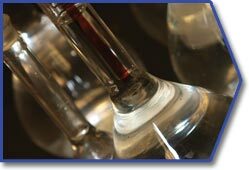 "Chem-Plate Industries is one of only two facilities in the United States to adopt such a progress system. "Being open to this kind of innovation, along with our total commitment to quality and utilizing the talents of our staff, is what has made us the successful company we are today," Aaron continues. "We'll keep on maintaining those standards of excellence in the future so that we can continue meeting our customers' requirements."